Donsol, is a small fishing town, 600Km away from Manila located on the southwest coast of Luzon. 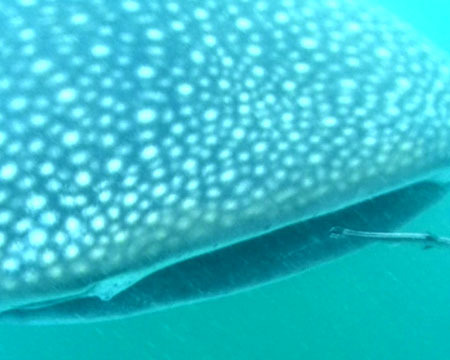 For a long time this area in Philippines is frequented by Whale Sharks, called “Butanding” in local Filipino dialect. Local fishermen were aware of them but it was like a best kept secret. Some fishermen used to eat their meat. It was only in 1998 that a team of foreign divers publicized their existence.After this, hunters swarmed this area to chase them, luckily the Filipino government stepped in quickly and declared this variety of fish as a protected species. Butandings, although called as Whales are not mammals like other whales but they are actually fish and belong to group of sharks. However, this type of shark is not a predator like other varieties of sharks and just feeds on the plankton and small fish. Thus, in a sense a giant vegetarian fish. The seawater of Donsol have just the right temperature and are rich in plankton that attracts them. Butanding actually means “Gentle Giant” in the local dialect and this represents their true nature. This is the largest fish in the world and grows up to the length of 60 feet and weight up to 15 metric tons. We have never heard of them hurting humans intentionally although sometimes collisions with fishing boats are common. After declaring it a protected species and after knowing its behavior, the Filipino government was quick to spot the opportunity for “Eco-tourism” in Donsol. Butandings are found in this region from February to June when they migrate looking for the right water temperature and food. Visiting Donsol: how to go, where to stay, what to do.